Dr. Cara Christ, who runs the Arizona Department of Health Services, says student immunization rates have fallen for three straight years, increasing the risk of an outbreak of a preventable disease like measles or mumps. 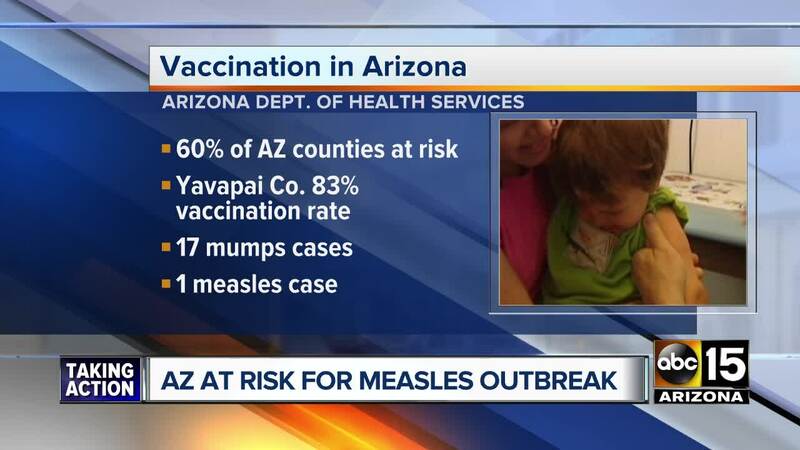 PHOENIX — Arizona's top health official says increased use of immunization exemptions are putting the state at risk of an outbreak of diseases. Health Services Director Cara Christ said in a blog post Friday that nonmedical exemption rates of students have increased across all age categories three years in a row. Arizona law requires that children attending school or child care must obtain certain vaccines unless exempted by a doctor for medical reasons, or by a parent for personal or religious reasons. Christ says religious-belief exemption rates for child care-preschool have increased to 4.5% from 1% since 2000, while personal belief exemption rates in kindergarten have risen to 5.9% from 1.4% and in 6th grade to 6.1% from 1%. Exemptions for medical reasons are rare.